Like the creators who use their gear, adidas is committed to their craft. They believe that sport has the power to change lives. adidas creates innovative products, apparel and footwear for athletes and designs sport-centric streetwear for everyone. Their goal is to promote creativity and encourage anyone to harness the power of sport in their life. Use this gift card at adidas retail locations or online at adidas.com. 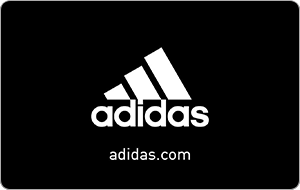 adidas Gift Cards may be redeemed for merchandise on adidas.com and in adidas Sport Performance, adidas Originals, and adidas Outlet stores in the United States. They are not currently available for International use. adidas Gift Cards are not redeemable at miteam.com, yeezysupply.com, TaylorMade, y-3, Reebok or Rockport. Gift Cards cannot be used to purchase another Gift Card. Promotional offers or discounts do not apply to the purchase of Gift Cards. Gift cards are not returnable, and cannot be redeemed for cash unless required by law. A maximum of five (5) Gift Cards may be redeemed on one order. If the amount of your Gift Card(s) does NOT cover the total order amount, the remainder of the purchase balance can be paid with an accepted alternate form of payment. Your Gift Card will not expire as long as there is value remaining on the Gift Card. You can use it anytime. Any remaining value that is left on your Gift Card will be stored and available for your next purchase. We ask that you safeguard your card and treat your Gift Card as you would cash. Do not share your Gift Card Code and PIN. We are not able to replace or replenish Gift Cards that are lost, stolen or used without authorization.